Go Fly a Kite… On the Crystal Coast! Here on the beaches of the Southern Outer Banks, it’s always the right season to come fly your kite. And if you’re in need of such a “flying machine”, there is no better place to purchase said “stringed aerial apparatus” than at Kites Unlimited (& BirdStuff, etc.) in Atlantic Beach. Located in the Atlantic Station Shopping Center just down from the Outer Banks Outfitters marine store, this is one shop that is a must on your list of Atlantic Beach shops to visit. 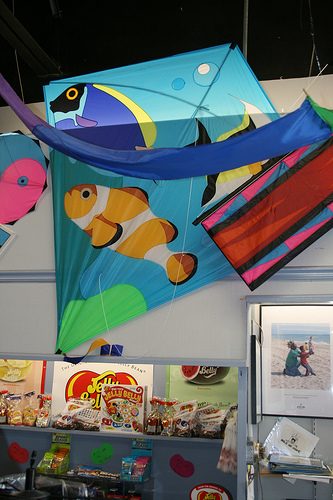 Store Owner Don and his fine staff offer hundreds of assorted single line and steerable kites in many shapes and sizes. From beginner flyers to kites for the serious expert and all skill levels in between, you’re sure to find the right kite to satisfy your fun factor. 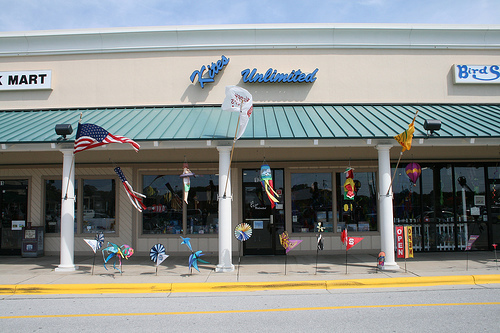 Don’t forget, Kites Unlimited offers a wide range of other fun items including windsocks, flags, unique games and puzzles. Offering all manner of bird feeders and other bird stuff, the opposite side of the store is jam packed with feeders, seed, birdbaths and birdhouses. Kite Fly-In Hits The Beach! One of the biggest events to hit the Crystal Coast in the fall is the annual Carolina Kite Festival. 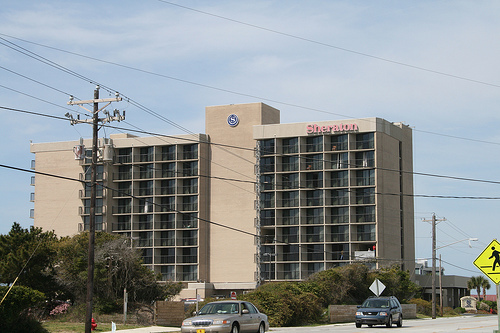 Held each year in late October at the Sheraton Atlantic Beach Oceanfront Hotel, this event attracts many participants with assorted kites and skill levels. Open to anyone who wishes to participate, this is one of the more popular events held on the Crystal Coast. Have you purchased a kite from Kites Unlimited & BirdStuff, etc? Tell us about your experience. Flips Flops in Emerald Isle – It’s Not Our Shop! Does Your Crystal Coast Beach Cottage Have a Name?